I have this terrible personality trait, that sees me wanting to do the opposite of what everyone else is doing when I get bored of seeing too much of the same thing. I guess because I live, breathe and dream interiors, perpetually soaking up images and often seeing the same things over and over, I get bored and want to move on pretty fast. Don't hate me. I was getting really over dark walls if I'm honest, until my attention shifted to lacquered walls, which has made me fall in love all over again. A dark lacquered wall is like magic. Breathing so much life into a room, and I just can't get enough. Lacquered walls are most certainly not new, and I've always been drawn to these glamorous rooms with high shine walls, but lately the pull has become much stronger. 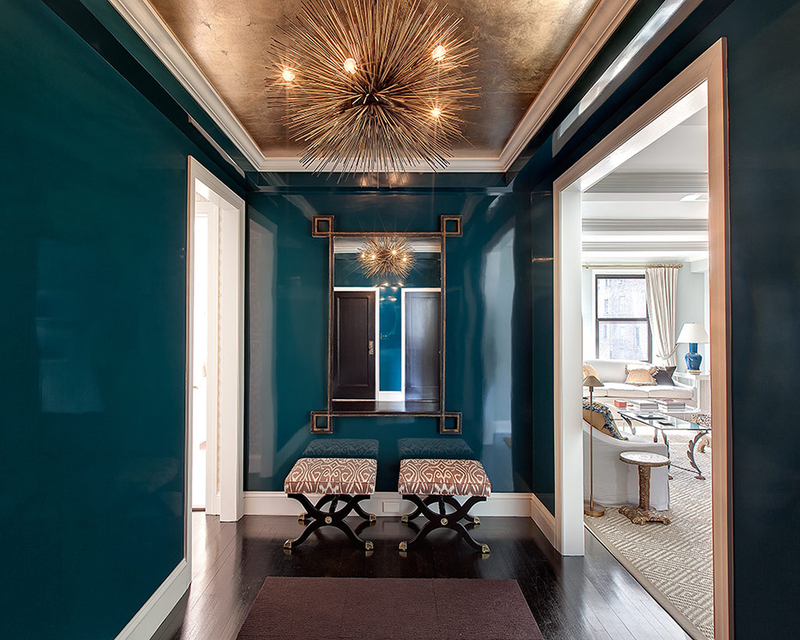 It's amazing how much lacquered walls (and ceilings) can take that glamour to another level entirely. Now all my flat chalky walls, look so, um.....flat. And chalky. How is it that something you once loved, can suddenly feel so....dull!? We've not really got onto the lacquered wall thing here in the UK, and in fact all the reference images below are from homes in New York. I'd like to think we'll see some lacquered walls popping up more and more, but I won't hold my breath. And perhaps this lack of demand is why there seems to be a complete absence of products on the market in the UK aimed at helping one get that lacquered look. Sure we could spend literally thousands getting a pro in to do the real thing, but most of us don't have that kind of money, and I would like to achieve the look without bankrupting the family, or exposing us to noxious fumes. Surely it's possible?! Many of the 'lacquered' walls we see these days aren't real lacquer at all - the real thing being a dying art that requires a huge amount of work and countless coats of sprayed on lacquer. I came across a paint called Hollandlac by Fine Paints of Europe (ironically not available here!) that looks and sounds like it would be closest to the real thing. It's produced by a Dutch company who I've contacted to see if there is an equivalent available in the UK. I'm awaiting their reply and trying not to get my hopes up! Try as I might, I can't find another single product that is marketed at creating a super high gloss lacquered look on internal walls and ceilings. Well there may be one or two but the reviews are not promising. I expect that one way to go would be to paint your wall colour in a water-based eggshell, followed by several coats of a crystal clear, super high-gloss water based varnish. I imagine a light sand between coats will be in order, and yes, it does sound like a lot of work. Will you just look at that? Doesn't that make your flat black walls, seem a little sad? People say you need to start with perfect walls because lacquer will show up every single little lump and bump, but it actually doesn't bother me and I think that a dark lacquered wall would distract somewhat from imperfections with all that light bouncing around. I want it, and I want it now. I discovered some incredible designers whilst researching this post. And I'm so pleased I did. Jackie Astier (above, who works in fashion rather than interiors these days) is among them, and I realise now that I have pinned her entire apartment over the years without realising the various rooms were all under the one roof! Needless to say, hers is one of my all time favourite homes, and if I had black lacquered walls in my house like she does, I'd be laughing like that too! The image above is a space by Christina Murphy and those glorious green walls are apparently painted with the Hollandlac paint mentioned above. It only makes me want it more. If you want to see more, pop over to my 'Lacquered' board on Pinterest where there are loads more gorgeous rooms to look at. And it's not just dark walls that look great lacquered, even white gets a personality injection when given the glossy treatment. 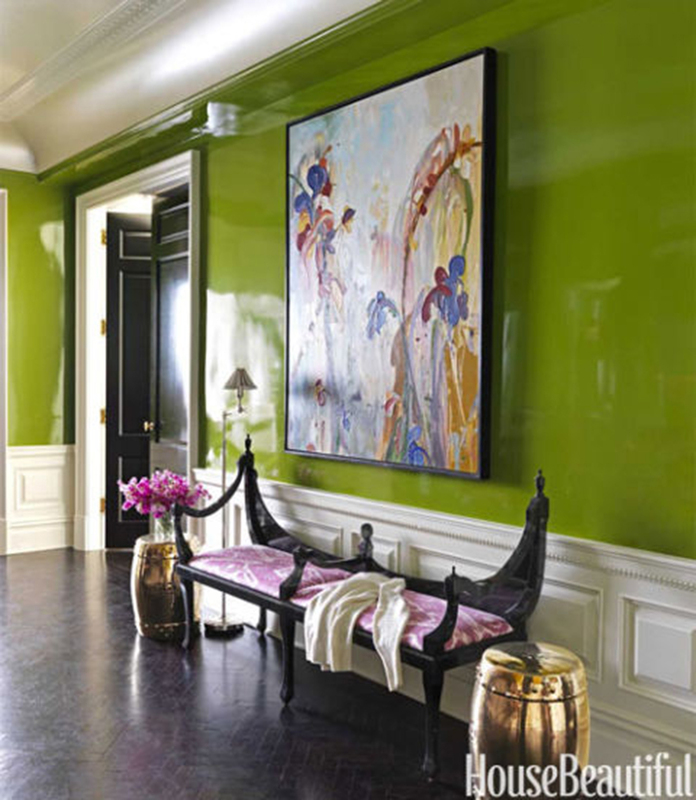 What do you think of lacquered walls? Have I convinced you it's the way forward, or is it a bit too over the top? Oh, and if anyone has any actual experience in achieving a lacquered look on walls and or ceilings, please let me know what you did, I need to know! The lady from Madaboutthehouse used gloss paint which seemed to work really well. PSA: I live in the UK in a Victorian house too and asked my father inlaw about achieving lacquered walls or something like them. He warned me not to bc using gloss paint or something like varnish would keep the walls from breathing and cause an issue like damp. Would be fine on an interior wall, maybe, but any wall that's an exterior wall would have issues. Basically seals moisture into the wall and even repainting wont fix it. Perhaps I'm exp!aiming it rubbish but but he's a surveyor so I trust him. Sadly my house doesn't have any rooms without an exterior wall or I'd give it a go! Oh thank you! That is (sadly!) a really excellent point. I wonder if he's referring to oil based products or if water based products would also cause the same issues. And I wonder if ceilings would be an issue. In my bathroom, I'd really love to do the ceiling and one internal wall. I guess my hallway would be okay because it's an internal wall and a party wall. Would your clever dad be up for answering more questions!? Thanks so much for commenting! Guess who spoke to multiple damp specialists who said my whole house needed dampwork? Moi. Every single one said different and conflicting things. Except for one guy who said nope, just seasonal wetness on the exterior wall and the party wall issue is resolved after running a dehumidifier for a week. A party wall really shouldn't have a damp issue so that was concerning. Various opinions but no one can say for sure why that happened. A leak? Wallpaper didn't let the wall breath? A breakdown in the damp proofing from when the house was built (slate course I think)? Who knows. Victorian houses were built to breathe. Over the years repairs have been made in many houses that aren't great for that like repointing with cement over lime mortar or pebble dashing over brick but what can you do? Found out my dining room was replastered by the previous owners with special damproof plaster after damp course injections 2 years ago...so then why do we have problems with wet walls? The area below the injections in back is dry but above them is wet. I looked into it and damp course injections are water based, some people think true rising damp is very rare and that damp specialists are cowboys (it isn't regulated). I have to run a dehumidifier to keep the walls dry now. I really shouldn't be having problems but I do! I painted my dining room black so I really couldn't tell you if any mildew were present. I can definitely say that with our year round humidity in the UK my walls feel damp if I dont run the dehumidifier for a few days. Wall paint emulsions are forumalted in various levels of gloss or sheen. Father inlaw advised not using anything high gloss bc it keeps the walls from breathing. After further interrogation the biggest issue would be exterior walls. If a house had an interior walled hallway high gloss should be okay (unless your party wall is like mine) but painting over it would be a nightmare so dont change your mind anytime soon I guess lol! He's really against that for our walls but not everyone will have an issue. I mean like the rendering over brick wall thing I mentioned, not the best idea but might not cause an issue so leave it if you have it. Us old house owners know to expect some issues right? Farrow and Ball do a high gloss (95%) that's water based, maybe several coats of that and water based varnish? Not really seeing many DIYs on this. Oh what a nightmare and how weird about your unexplained damp issues - particularly with the party wall. I have to admit that your first comment, put the fear in me, and even though my somewhat rebellious nature would normally think, bugger it, and do it anyway, it makes a bit too much sense to not take heed. It could obviously be a really costly error, so thanks. There are definitely some very mild damp issues in one corner of my dining room (external walls) which I don't want to exasperate, even though I love the idea of the lacquered look in a dining room in particular! So I'll admit defeat for that room, and the adjoining living room. But of course, I can't leave it at that - the rooms I'm decorating next are on the top level of the house, which was added about four years ago. Although they have external walls, they're all insulated stud walls, and we definitely don't have damp issues up there, and they might be ripe for some experimentation! If I go for it, I'll definitely be blogging about it. The ceilings are quite low and would look amazing painted the same colour as the walls, and given the 'lacquer' treatment all over. I like to make life hard for myself! Thanks again for chiming in, really appreciate it. You're right, there really aren't many DIY's on the topic - maybe for good reason, or maybe not! Oh that sounds nice! Stud walls should be fine, love the idea of the wall and ceilings matching. I want to do a similar thing in my living room but not gloss.